What was it like when you first started blogging? Exciting! I had no idea what I was doing but I remembered being excited all the time. I remember looking at other established blogs and hoping that one day I would be there. It was daunting but exhilarating. How are you able to balance school and blogging and reading and everything else in between? It is hard. I am studying for my degree, I have a job, I have a lot of other stuff going on as well. There have been times where I have had to consider quitting the blog, but I have put so much work into it and I enjoy it too much. I try to make sure that blogging doesn’t take over everything. What made you name your blog Reading Under The Willow Tree? Do you read under trees a lot? Honestly it was through desperation. 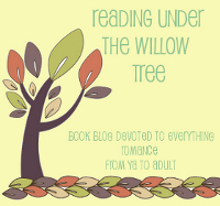 I named it something else and was told that there was another blog with that name, so I had to change it and Reading Under the Willow Tree seemed good enough at the time. I am happy with it and wouldn’t change it. I never read under trees, I suffer from a lot of allergies so trees are a no go for me. What book/s are you pining for? So many, Ruins by Dan Wells the last book in the Partials series, the last divergent book, the serephina sequel. There are too many to count. Have you ever had a reading/blogging slump? If yes, how were you able to get out of it? If no, what keeps you going? Yes, I have had two major slump. Twice I allowed reading and blogging to get out of control and it became my life. When I get like that I need to step away for a while. I will normally not read for a couple of weeks and eventually I get over it. If you could pick a cast of actors for a movie adaptation of your favorite book, who would those be? I would cast Tom Hiddleston as Kanin in the Immortal Rules. Joel Edgerton as Shadow in American Gods (which is one of the best books I have ever read) actually whenever I read anything with an alpha male I tend to see Joel Edgerton in that role…I am a little obsessed with him to be honest. Sam Claftlin tends to be my pick for most YA books. Singer/band: Changes a lot but right now Of Monsters and Men is my fav band.